It doesn't look very magical does it? Add all the circled numbers together and note your answer. Try again with a different starting number. What do you notice? This problem was made to celebrate NRICH's tenth birthday - perhaps you can see the connection! Let's try a different one with larger numbers. What is the magic total this time? I will show you how this kind of matrix works. You can then invent one to try on your friends! First you need to choose your 'magic total'. As you know, I chose $100$ for the matrix above. You can download a sheet of them here. Now you know how the matrix works, you are ready for the real problem. 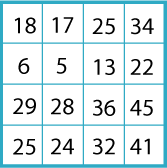 Can you work out what numbers were used to make any of the original three matrices? Working systematically. Interactivities. Investigations. Combinations. Calculating with fractions. Multiplication & division. Generalising. Calculating with decimals. Trial and improvement. Addition & subtraction.